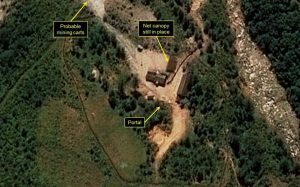 North Korea is suffering an unusual and self-inflicted setback in its nuclear weapons development programs — “mountain fatigue.” North Korea uses underground facilities in Mount Mantap to test its nuclear detonations. The most recent test on Sept. 3 was of an H-bomb, North Korea’s most powerful yet, estimated to have produced a blast of up to 280 kilotons. The combined effect of this blast and prior tests has hollowed out and weakened the structure of the mountain itself. Based on seismic readings from the area, including a series of earthquakes, Japanese and Chinese scientists had warned North Korea that the mountain was in danger of collapse. A collapse of this sort could prove disastrous to China because it could release a huge cloud of buried radioactive material that would be carried by prevailing winds over Chinese cities. Then on Oct. 30, as reported in this article, the warnings proved correct. Several tunnels collapsed, killing as many as 200 North Korean workers. It was not the total collapse some feared, but it was an indication that the threat of total collapse is real. Yet nature may have the last word. If the Mount Mantap facility is rendered unusable due to extraordinary damage, Kim will have to continue his nuclear weapons testing elsewhere. This implies tests in the atmosphere, something Kim had already threatened to do before this recent tunnel collapse. That will be viewed as even more provocative by the U.S. and the rest of the international community. The vagaries of nature as expressed in a collapsing mountain may provoke one more escalation on the path to war in the form of atmospheric tests of nuclear weapons.